Area, as many other mathematical concepts, has experiential origins. Intuitively, this is the measure of expanse associated with plane figures. Area is a \(2\)-dimensional analogue of the \(1\)-dimensional length and \(3\)-dimensional volume. Paint containers carry a mention of the area the paint should suffice to cover. Area of a forest region is an indicator of the number of trees that grow there, and vice versa. As many other mathematical concepts, area can be defined in a variety of ways. The context and potential applications may dictate which of the possible definitions is preferable under given circumstances. Congruent shapes have equal areas. If a polygon is split into a finite number of polygons then its area is the sum of the areas of the pieces it is split into. We could have formulated that differently: the area of a rectangle is the base times the height. In this form, the statement also holds for parallelogram. 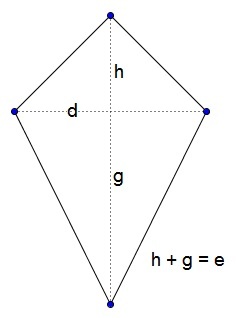 This could be seen from the diagram below, where a triangle in a parallelogram is cut off at one side and added at another to form a rectangle. (In reality the situation is a little more complex than that.) 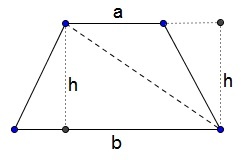 If we denote the base $b$ and the height $h$ then $S=bh$ is a valid formula for the area of both rectangle and parallelogram. J. Hadamard, Leçons de géométrie élémentaire, tome I, 13e édition, 1947, Editions Jacques Gabay, 1988, ISBN 2-87647-038-1.